Durable molded trucks handle heavy loads with ease. Unibody design promotes a more discrete appearance. Designed for durability using modern structural foam technology. The frameless design supports USDA Meat and Poultry Equipment Compliance. Fits through standard commercial doorways. The ergonomically designed steering wheel handle provides excellent handling and maneuvering. Specifically designed for controlled dumping by one person. Inset wheel positions prevents damage to surroundings. Optional hinged domed lids are available. Available in 3 sizes 1/2, 3/4 and 1 cu. yd. 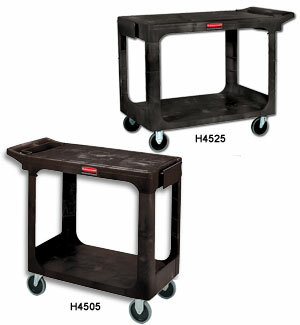 Features large, non-marking casters. Large capacity up to 2,100 lbs. Black in color. FOB Shipping Point. Structural foam molding eliminates the need for a metal frame and provides a seamless, leak-proof body that won't rust, chip, dent or peel. Product No. Cap. (lbs.) Size L x W x H Color Wt. (lbs.) Price Ea. L x W x H Wt. (lbs.) Price Ea.